The No. 91AZ is a set of 3 steel rasps designed for use while working specifically in plaster, yet can be used with Plastilina, self-hardening clay, moist clay and wax as well. One end of these tools is rounded while the other has been squared off. 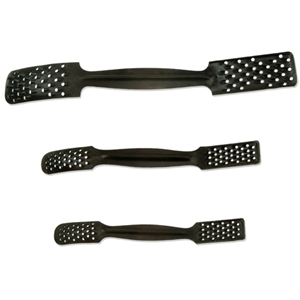 The tools' perforated blackened steel make it easy for excess material to pass through its multiple holes. Rasps range in length from 6 1/2" to 9".